If you're someone who likes to customize their user experience, stock Android is a lot like a blank canvas. The firmware that comes preinstalled on Nexus devices is just Android—no manufacturer skins or carrier bloat involved. This simplicity opens up the door for many root mods and flashable ZIPs that can be installed in a custom recovery. Such mods, however, often require a reboot or a complicated button combination to enter recovery mode. Sadly, as bare-bones as it is, stock Android does not include a "Reboot" or "Reboot to Recovery" option. We've covered options for enabling a "Reboot" dialog on stock Android in the past, but none of these are compatible with Lollipop. Fortunately, though, there's already an app that will bring a full reboot menu back to your rooted Android 5.0 device—and it's about as easy-to-use as it gets. 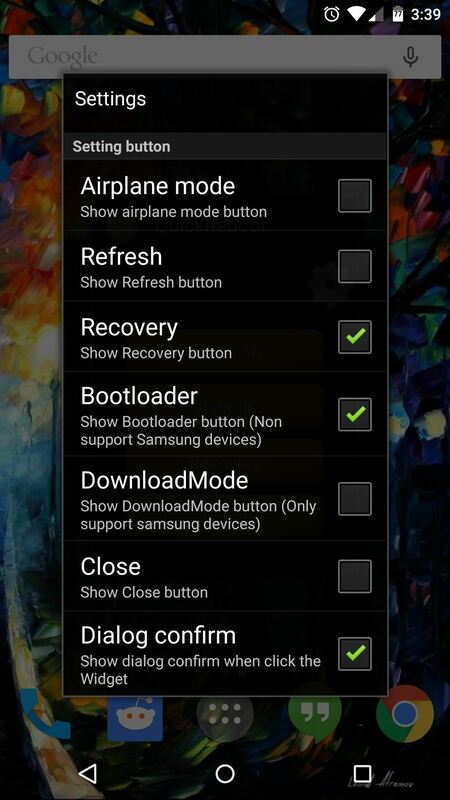 The app that brings a full-fledged reboot menu back to Android 5.0 is called Quick Reboot (Root) from developer PhongIT. Install it and head to the next step for its configuration options. 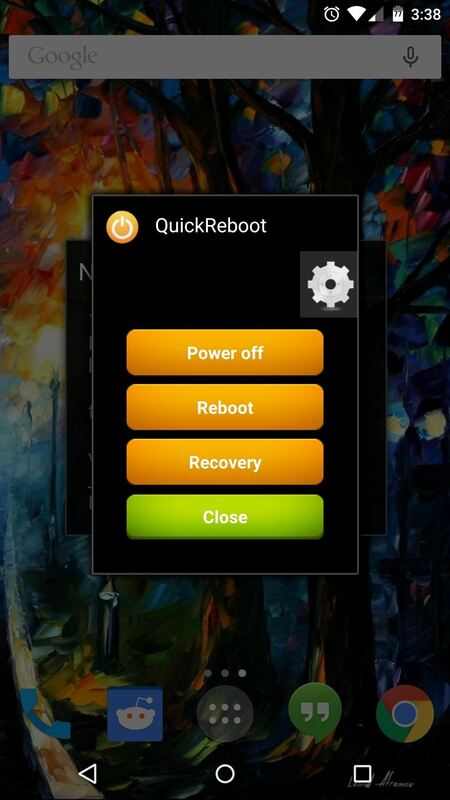 By default, Quick Reboot gives you three options: "Power off," "Reboot," and "Recovery." If you'd like to add more options or remove any existing entries, long-press the gear icon, then select "Settings." From here, you can choose which options you'd like to display, then when you head back out, your changes will already be in effect. 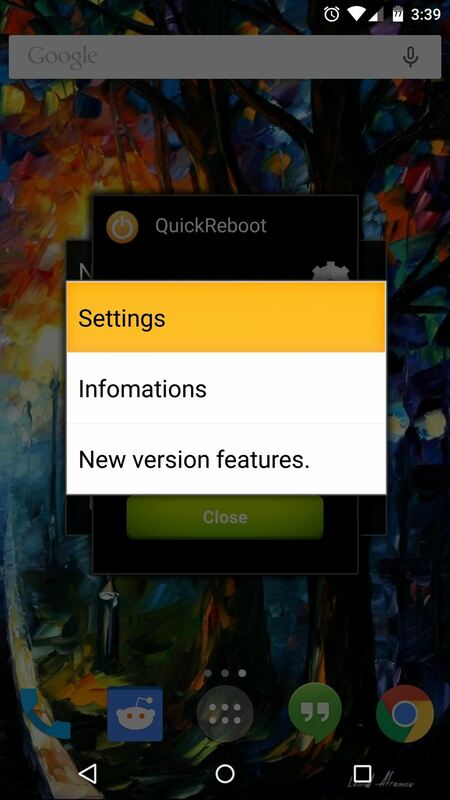 The first time you use Quick Reboot, the app will ask for Superuser access. Tap "Grant" on the popup, then your device will immediately reboot. 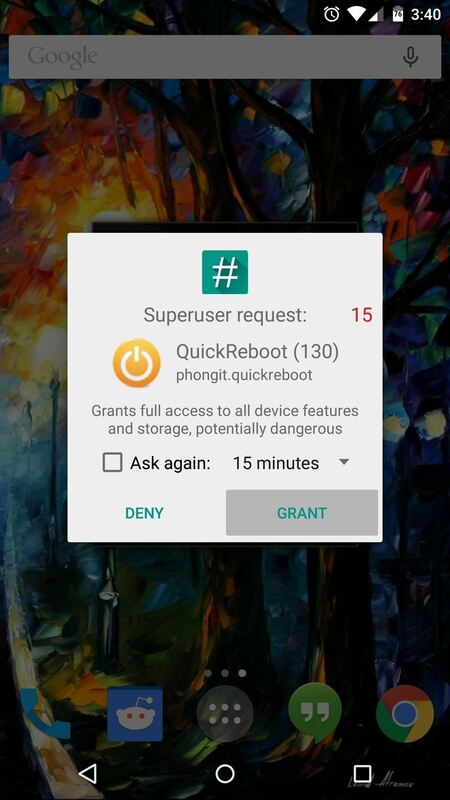 After giving Quick Reboot Superuser access the first time, you'll won't have to bother with this menu again—just tap the reboot option you want, and it will happen immediately. How often do you find yourself using Quick Reboot? Let us know in the comment section below, or drop us a line on our Twitter or Facebook feeds. I've not rooted my phone, but still found a way to reboot the phone using what I think is a bug in Lollipop. Ha, cool tip! I had that happen to me just the other day, but didn't make the connection.